This is an extract from TIME magazine and it is about how the FRIENDS Programs can help kids prevent issues when they become teenagers. “THE KID WHO PUTS TACKS ON CLASS-mates’ chairs and turns his math tests into paper planes may have a problem, but chances are someone will act quickly to find out what it is. Maybe it’s one of the attention disorders so commonly diagnosed these days: perhaps there’s trouble at home. The point is that disruptive children don’t go unnoticed. But what of the child in the same classroom who never acts up and whose reports are full of ticks in the right boxes? Though easy to teach com-pared to the troublemaker, some children like this might also be crying out for help, if only they could summon the nerve. Thanks to a new Australian program, help might find them first. The prevalence of anxiety among children in many developed nations seems to be rising. Whatever the causes (and the decline of the extended family, over emphasis on achievement and a general speeding up of life are all possibilities), it’s estimated that between 15 and 20% of kids feel anxiety that diminishes the quality of their lives. Put simply, these children spend too much time worrying, ruining what should be their most carefree years. This is done with a Barrett-designed program called FRIENDS, which is used widely in Australian hospitals and clinics to treat anxious children and depressed adolescents. But it’s as a course presented in both primary and secondary schools and aimed at preventing anxiety that FRIENDS (a mnemonic for Feeling worried?—Relax—Inner thought—Explore plans—Nice work, reward—Don’t forget to practice—Stay calm) is taking off. By helping young people to accept their feelings as legitimate and showing them techniques of positive thinking and problem solving, the program “builds their emotional resilience,” claims Barrett, who is also associate professor of psychology at Griffith University. 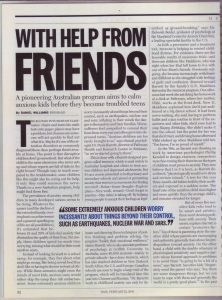 In Australia, some 40,000 students—mainly in private schools—have done FRIENDS, which has also reached children in New Zealand, South Africa, the U.S. and Europe. Canadian schools are soon to begin a large trial of the program, which will be translated later this year into Chinese and Russian. “Dr. Barrett’s work in childhood anxiety can only be described as ground-breaking,” says Dr. Deborah Beidel, professor of psychology at the Maryland Center for Anxiety Disorders. a leading specialist facility in the U.S. In the ’90s, as Barrett was drawing on work by American psychologist Phillip Kendall to design FRIENDS, researchers were fine-tuning their theories on the types of children most prone to anxiety. They now believe that 1 in 5 is born, as Barrett describes it, “physiologically sensitive to stress and certain stimuli.” A test for this sees three-month-old babies held by their mothers and exposed to a sudden noise. The heart rate of the sensitive child rises higher and more quickly than the average child’s, and remains elevated for longer. But of every five sensitive kids (who tend to be smart and artistic), three won’t develop problems with anxiety. Their secret, explains Barrett, is certain “protective factors:’ ‘fop of these is parenting style: the sensitive child whose parents are encouraging and optimistic generally rises above his predisposition toward anxiety. On the other hand, a child with the double whammy of physiological sensitivity and negative parents whose favored approach to problems is to avoid them “is going to be a bit of a mess,” says Barrett. Sensitive kids “desperately need the parent who says, ‘Yes, there are some dangerous things, but we can learn to cope with them and generally the world is a pretty good place. '” In the past few years, researchers have become convinced that other things can help prevent children from lapsing into anxiety, including a school environment that is welcoming and puts participation above achievement, and a network of friends. Barrett first read psychologist Kendall’s work while researching her Master’s thesis on childhood fears in 1992. She was fascinated, and later wrote to him seeking permission to develop it. 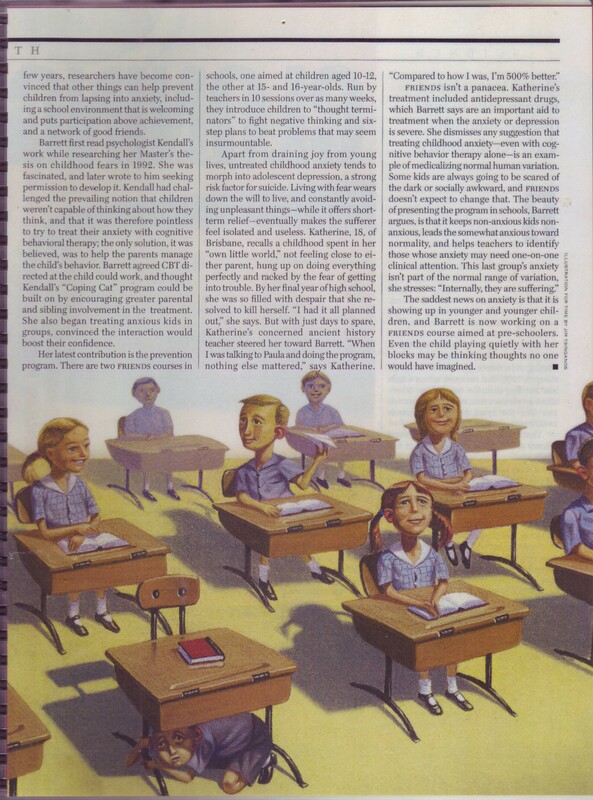 Kendall had challenged the prevailing notion that children weren’t capable of thinking about how they think, and that it was therefore pointless to try to treat their anxiety with cognitive behavioral therapy; the only solution, it was believed, was to help the parents manage the child’s behavior. Barrett agreed CBT directed at the child could work, and thought Kendall’s “Coping Cat” program could be built on by encouraging greater parental and sibling involvement in the treatment. She also began treating anxious kids in groups, convinced the interaction would boost their confidence. Her latest contribution is the prevention program. There are two FRIENDS courses in schools, one aimed at children aged 10-12, the other at 15- and 16-year-olds. Run by teachers in 10 sessions over as many weeks, they introduce children to “thought terminators” to fight negative thinking and six-step plans to beat problems that may seem insurmountable. FRIENDS isn’t a panacea. Katherine’s treatment included antidepressant drugs, which Barrett says are an important aid to treatment when the anxiety or depression is severe. She dismisses any suggestion that treating childhood anxiety-even with cognitive behavior therapy alone-is an example of medicalizing normal human variation.